An 1830 CE painting depicting Arjuna, on the chariot, paying obeisance to Lord Krishna, the charioteer. gitentoli patram charuch. Dhritoraxttr ani sonzoi hanchi ek zoddi. Bharti-i zhuzachi gozal somzun gheupakhatir dhritoraxttr sonjeak ekuch ani toi bi poiloch prosn vicharota. Dusri, punn mukhel zoddi krixnn ani orzun hanchi. Krixnnan gita zhuzamollar (kurukxetrar) sangli. Punn gitechi xikounn nikhtti zhuzamolla merenuch merauna. Ti kall thollacheo mero hupun sogllech monis kullyek odd laita. Aplea monatunch xodd-ripunkodden disoptt'ttem zhujchem poddil'lean gita kolleche vellar taka alaxiro divn tachea jivitak novi dika dakhoita. Gitek yogxastr mhonnla. Yog mhonnlear jem zoddtta tem. Ti ek sadhna. Jivatmo ani pormatmo hanka zoddtta ti sadhna. Ti onek margamni sadpak yeta- gonean, korm' va bhoktiyogan va he tinuy marg apnnavun. Aplea sobavak manot tea margan monxan cholpachem ani aple jivit voilea pamvddeacher vhorpachem. Orzunak bodh korpachea nimtan krixnn amka soglleankuch xittkaita : "tumchea monantlea voireak tumi poili sauropak zai. Gonean, korm' ani bhokti hea sadhnanchea palvan tumi pormexvorak zoddpak zai. Kormofollachi itsa, suvarth, ohonkar adi vikar soddun tumchi lagnnuk pormexvorapasot korpak zai." "Xribhgountalem Git" ho gody onnkar xennoi gõybab hancho. 1935 vorsa kel'lo ho onnkar 1959 vorsa famad zalo. To bharti-i bhaxam'mdlea gitechea onnkara poikim ek bhouch boro onnkar. Tea kallachi goroz mhunn ani konknniche obhivyoktichi tank dakhouche pasot tannim onnkarachi bhas xud'dh douropacho yogone kelo. Tannim konknni onnkarat paribhaxik ani totsom' utram vaprunk na. Bhagavad Gita comprises 18 chapters (section 25 to 42)[web 1] in the Bhishma Parva of the epic Mahabharata and consists of 700 verses. Because of differences in recensions, the verses of the Gita may be numbered in the full text of the Mahabharata as chapters 6.25–42 or as chapters 6.23–40. [web 2] According to the recension of the Gita commented on by Adi Shankara, a prominent philosopher of the Vedanta school, the number of verses is 700, but there is evidence to show that old manuscripts had 745 verses. The verses themselves, composed with similes and metaphors, are poetic in nature. The verses mostly employ the range and style of the Sanskrit Anustubh meter (poetry)meter (chhandas), and in a few expressive verses the Tristubh meter is used. The Sanskrit editions of the Gita name each chapter as a particular form of yoga. However, these chapter titles do not appear in the Sanskrit text of the Mahabharata. [web 2] Swami Chidbhavananda explains that each of the eighteen chapters is designated as a separate yoga because each chapter, like yoga, "trains the body and the mind". He labels the first chapter "Arjuna Vishada Yogam" or the "Yoga of Arjuna's Dejection". 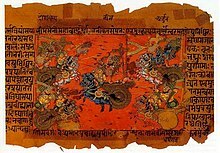 Sir Edwin Arnold translates this chapter as "The Distress of Arjuna"
Krishna displays his Vishvarupa (Universal Form) to Arjuna on the battlefield of Kurukshetra (chapter 11). Karma–Sanyasa yoga (Religion by Renouncing Fruits of Works contains 29 verses): Arjuna asks Krishna if it is better to forgo action or to act ("renunciation or discipline of action"). Krishna answers that both are ways to the same goal,[web 8] but that acting in Karma yoga is superior. Raja–Vidya–Raja–Guhya yoga (Religion by the Kingly Knowledge and the Kingly Mystery contains 34 verses): Krishna explains how His eternal energy pervades, creates, preserves, and destroys the entire universe. [web 12] According to theologian Christopher Southgate, verses of this chapter of the Gita are panentheistic, while German physicist and philosopher Max Bernhard Weinstein deems the work pandeistic. 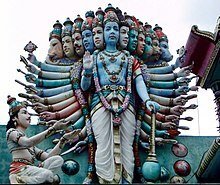 Visvarupa–Darsana yoga (The Manifesting of the One and Manifold contains 55 verses): On Arjuna's request, Krishna displays his "universal form" (Viśvarūpa),[web 14] a theophany of a being facing every way and emitting the radiance of a thousand suns, containing all other beings and material in existence. Purusottama yoga (Religion by Attaining the Supreme contains 20 verses): Krishna identifies the transcendental characteristics of God such as, omnipotence, omniscience, and omnipresence. [web 18] Krishna also describes a symbolic tree (representing material existence), which has its roots in the heavens and its foliage on earth. Krishna explains that this tree should be felled with the "axe of detachment", after which one can go beyond to his supreme abode. ↑ Bannanje, Govindacharya. "Bhagavad Gita pravachana" (PDF). 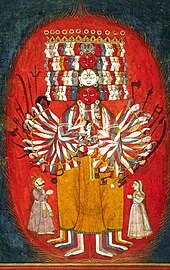 Tara Prakashana. ↑ Max Bernhard Weinsten, Welt- und Lebensanschauungen, Hervorgegangen aus Religion, Philosophie und Naturerkenntnis ("World and Life Views, Emerging From Religion, Philosophy and Nature") (1910), page 213: "Wir werden später sehen, daß die Indier auch den Pandeismus gelehrt haben. Der letzte Zustand besteht in dieser Lehre im Eingehen in die betreffende Gottheit, Brahma oder Wischnu. So sagt in der Bhagavad-Gîtâ Krishna-Wischnu, nach vielen Lehren über ein vollkommenes Dasein."